Unique! Earth Tones Dent is like no other corn. Each ear is a jewel in delicate pastel shades of lavender, bronze, mauve, gold, periwinkle, and green. Gorgeous in fall decorations, wreaths, and floral arrangements. Can be ground into flour. Another favorite idea is to use this corn to feed neighborhood birds and squirrels. Grows 4-6' tall. Matures in 85-95 days. Garden tip: As an open-pollinated variety, Earth Tones is susceptible to cross-pollination. 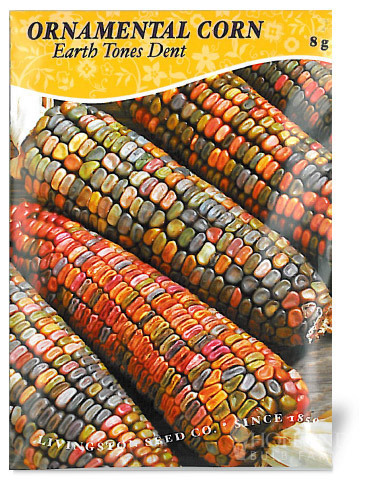 Isolate from other types of corn to preserve kernel color. Sowing early helps ensure well-dried ears. Ears will dry in about 21 days after their prime.